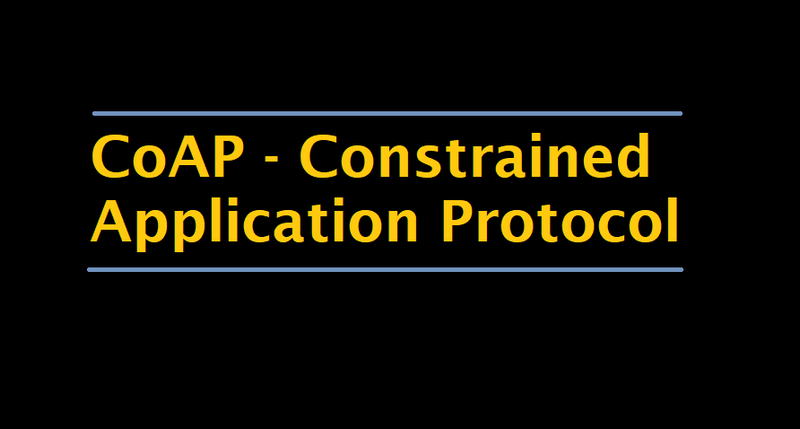 CoAP-Constrained Application Protocol is a specialized Internet Application Protocol for constrained devices, as defined in RFC 7252. It enables devices to communicate over the Internet. It is defined as Contrained Application Protocol, and is a protocol intended to be used in very simple hardware. The protocol is especially targeted for constrained hardware such as 8-bits microcontrollers, low power sensors and similar devices that can’t run on HTTP or TLS. It is a simplification of the HTTP protocol running on UDP, that helps save bandwidth. It is designed for use between devices on the same constrained network (e.g., low-power, lossy networks), between devices and general nodes on the Internet, and between devices on different constrained networks both joined by an internet. CoAP is also being used via other mechanisms, such as SMS on mobile communication networks. The Internet Engineering Task Force Constrained RESTful environments (IETF CoRE) Working Group has done the major standardization work for CoAP. The core of the protocol is specified in RFC 7252, which means that CoAP is still not a standard protocol. Observe at new events happened on sensors or actuators. Device management and discoverability from external devices. Your hardware cannot run HTTP or TLS: If this is the case then running CoAP and DTLS can practically do the same as HTTP. If one is an expert on HTTP APIs, then the migration will be simple. You receive GET for reading and POST, PUT and DELETE for mutations and the security runs on DTLS. Your hardware uses battery: If this is ones problem then running CoAP will improve the battery performance when compared with HTTP over TCP/IP. UDP saves some bandwidth and makes the protocol more efficient. node-coap is a client and server library for CoAP modeled after the http module. observe-11 for the observe specification. block-14 for the blockwise specification. It does not parse the protocol but it use CoAP-packet instead. If you need a command line interface for CoAP, check out coap-cli. node-coap is an OPEN Open Source Project, see the Contributing section to find out what this means. An important aspect to cover is the main differences between CoAP and MQTT. you may know, MQTT is another protocol widely used in internet of Things. There are several differences between these two protocols. The first aspect to notice is the different paradigm used. MQTT uses a publisher-subscriber while CoAP uses a request-response paradigm. MQTT uses a central broker to dispatch messages coming from the publisher to the clients. CoAP is essentially a one-to-one protocol very similar to the HTTP protocol. Moreover, MQTT is an event-oriented protocol while CoAP is more suitable for state transfer.